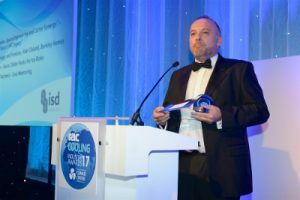 Andy Hudspith presents the ISD sponsored award to the team from Thermentor.org, at the RAC Cooling Awards 2016 at the London Hilton. Thermentor.org won the award amid stiff competition for their work in sustainability. ISD Solutions were sponsoring the Award category “Environmental Collaboration”.